Breakline offers educational programs and networking opportunities for veterans looking to transition into a new career. 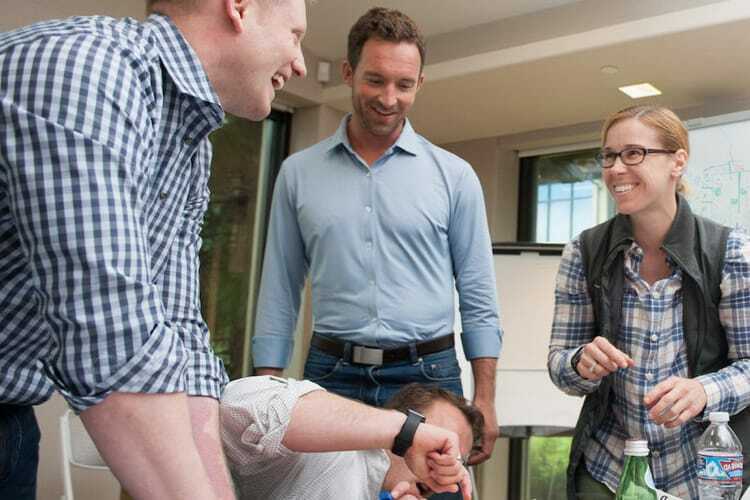 After serving our country, veterans leave the service with many valuable skills like strong leadership and work ethic, but transitioning into a new career can be challenging. 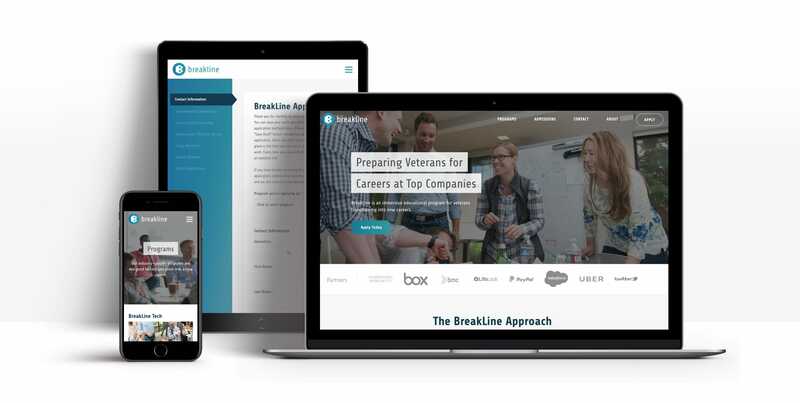 Breakline developed immersive educational programs to prepare veterans for new careers and connect them with hiring managers. Breakline came to us to re-brand the company and create a new website. They wanted to create a website that would make it easy and enticing for veterans to apply to their programs. The bold mark gives off a sense of stability which is important during a time of career transition. It is built out of smaller triangles and the negative space of “B” show the arrows pointing forward, directing students down the right path toward their new dream career. The lowercase wordmark gives the logo a softer and friendly tone. The font “Share” was selected since it gives off a techy and more futuristic feel, which relates the programs BreakLine offers. This inviting color palette portrays a sense of calmness especially in the stressful time of transitioning careers. The gradient represents Breakline’s desire to make that transition as smooth as possible. With a new brand established, we updated the elements on the website. For imagery, we used candid original photos to give their audience an inside look at what it’s like to be a part of Breakline’s hands-on programs. We designed custom icons that complement our logos through the use of filled geometric shapes. 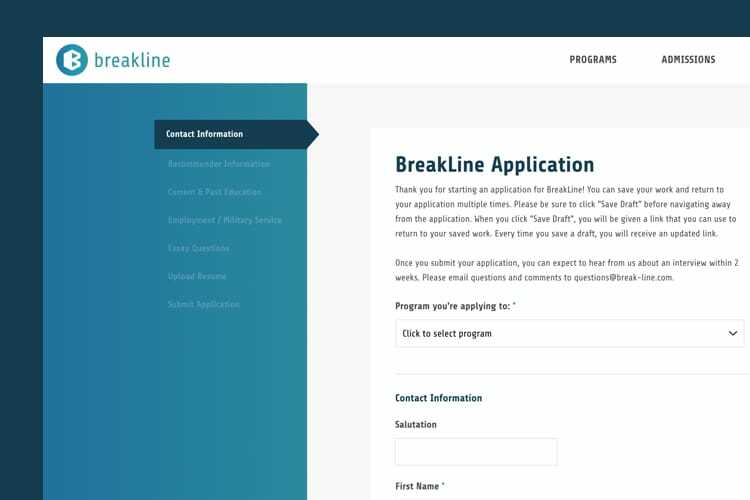 We designed several custom responsive templates that would best showcase their programs as well as highlight the impact that Breakline has had on its students. The website also includes an application form that is easy to navigate and broken down into digestible pieces for the user to help increase the number of submissions. In addition to the main website, we developed a partners portal to make it easier for Breakline to help partner companies manage the hiring process. The partners portal maintains consistent visuals with the website. With an intuitive navigation and easy to use search and filters, partners can easily find candidates with the right credentials. Each candidate also has a profile page that strategically shows all the most important information to hiring managers. We developed a custom WordPress theme, that allowed Breakline’s new brand is able to shine through. The partners portal is built on Ruby on Rails, which allowed us to build an application that would be easy for Breakline to manage. With the option to choose from a variety of layouts, content can be arranged in a way that makes sense. As a way to increase submissions, applicants have the option to save their progress and complete their application at a later time. Long pages with countless questions are a thing of the past with a multi-step form. All pages and application questions are easy to create and edit. Search and filter candidates that meet your open position’s requirements. Save the candidates that catch your eye. Since the launch of their new brand and website, Breakline continues to run successful programs attracting some of the most talented veterans and have been forming partnerships with some of the most sought after companies, including Airbnb, Facebook, Uber, and YouTube. With such a positive mission, Breakline is getting the attention and popularity they deserve, read about them here. Airbnb, Facebook, Uber, and YouTube are just a few of the big name partners that are teaming up with Breakline.